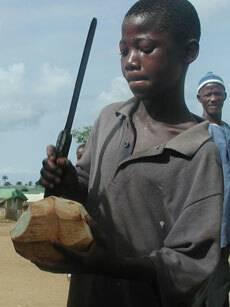 A Liberian boy tackles a coconut. As the second half of 2009 begins, global stock markets have rebounded. But this may mask much of the pain still being felt around the world, as unemployment remains a huge problem. Japan’s 5.2 percent unemployment rate is one of its highest since the end of World War II, while in Spain, unemployment has surged past 18 percent. But these figures pale in comparison to those in Liberia, where the vast majority of people — up to 85 percent — are unemployed. Worldfocus contributing blogger Myles Estey is in Monrovia, Liberia, and describes how people get by without formal employment. As the United States and Canada start to freak out that their unemployment rates approach the double digits, officially, Liberia’s unemployment rate remains, on paper, as 85 percent. Almost, but not quite, making it an inverse relationship. The CIA Factbook uses this 85 percent stat, and I think everyone else cites it and throws it around like its an iron-clad stat. Its not. While Liberia certainly lacks locations for official, regulated employment, that only 15 percent of the population works is an absurd assumption, and one that would be practically unattainable. While severe poverty is rampant, Liberians are not starving to death. Reason being, that as in any society where basic infrastructure has been destroyed, people find a way to get by. They fill in the gaps of people’s needs, finding small ways to deliver goods and services to the population at large. ‘Git my hustle on,’ as many say. In this hustle, profit margins are wafer thin. Full days of work often produce just a few dollars, which in turn often gets spread out to family and friends in need. How it works: Coconuts come to Monrovia packed into trucks and cars from villages all around the country. The outer husks have been hacked off with machetes, to reduce size and weight. Sellers are generally old women, who carry up to 25 or 30 on their head (which is psycho heavy), or young men who can carry up to 80 in wheelbarrows. Every seller carries a machete, allowing them to split the coconuts for anyone who stops them as they walk through the streets. They wait patiently as buyers drink, split the coconut to access the meat, take the empty shell, and move on. Cash: Street sellers buy them wholesale for around $10 LD ($0.14 US), or ‘2 for 15’ [$LD] at spots around the city. Coconuts generally retail for $20 LD. Meaning that to make a dollar, 7 coconuts must be sold – roughly 15 pounds of weight. Variables and Dangers: Insanely sore neck, machete wounds. Net Profit: For female sellers, they rarely earn $ 5 US /load. Some will take more than one load per day, but it is rare, as they often have families to tend to, and business can be slow. Wheelbarrow men can earn over $10 US/day, but this kind of profit demands a 10 hour day. To read more job profiles, follow Myles Estey’s blog. Photo courtesy of Flickr user usnico under a Creative Commons license. While it is a fact that times are hard in Liberia due to global financial crisis couple with the long standing war, the stated unemployment rate of 85% is no longer the case. Individuals have realised that self employment in terms of businesses can go a long way.